Several press reports [late February 2015] highlight details of the major donors to the Bill, Hillary and Chelsea Clinton Foundation, including right-wing Persian Gulf monarchies, big defense contractors, and an array of corporations and governments seeking influence with the US political establishment—and potentially in the next White House. Founded in 2001 after the end of Bill Clinton’s second term as president, the Foundation has raised and distributed huge amounts of money, reaching nearly $2 billion. After a brief drop in fundraising coinciding with Hillary Clinton’s term as secretary of state from 2009 to 2013, when most foreign donations were discouraged because of conflict-of-interest concerns, donations jumped $100 million in 2013, reaching $262 million. The list of the Foundation’s largest donors, available on the Foundation’swebsite, is a virtual who’s who of the super-rich and major corporations. The largest donors, having given over $25 million since 2001, include the Bill and Melinda Gates Foundation, well known for its leading role in the dismantling of public education, Chicago multimillionaire and top Democratic Party donor Fred Eychaner, and, strangely, the Dutch national lottery. Major corporations appear in spades in the list of 168 individuals and organizations that have given more than $1 million. Defense contractors such as Boeing and Booz Allen Hamilton, both gave between $1 and $5 million, joined by Barclays, Goldman Sachs, and the American Federation of Teachers. The reactionary Persian Gulf monarchies have poured tens of millions into the Clinton Foundation, including Saudi Arabia ($10 to $25 million), Kuwait, ($5 to $10 million), Qatar, Oman and the United Arab Emirates ($1 to $5 million). In addition, several groups and individuals close to the Saudi government have also made tens of millions in contributions. The Clinton Foundation made an agreement with the Obama administration not to accept new donations from foreign sources during Hillary Clinton’s tenure as secretary of state, a policy which has now expired. However, tens of millions of overseas dollars continued to flow into the Foundation through an exemption which allowed existing donors to continue making contributions at a similar level. In another case, the Foundation received a $500,000 donation from the government of Algeria for its pro-market “relief” effort in Haiti. TheWashington Post notes that the donation, which violated the Foundation’s earlier agreement with the Obama administration, came in the midst of a particularly heavy lobbying push from Algeria in Washington in the aftermath of a report by Clinton’s State Department condemning Algeria’s human rights record. The donation was more than the Algerian government spent on lobbying for the entire year. Two years later, Secretary of State Clinton lobbied successfully on behalf of GE in its bids to construct power plants in Algeria, described by the company as “some of its largest power agreements in company history.” A month later, GE donated from $500,000 to $1 million to the Clinton Foundation. The focus in the media, especially from Journal and other ultra-right outlets, has been on the fact that foreign countries, companies and individuals comprise a third of the foundation’s major donors, implying that they are purchasing political influence through the Clintons. While there is a degree of truth to this, this is also a two-way street, as the Clinton Foundation is fully integrated into the political apparatus as an instrument of American imperialist foreign policy. Instructive in this regard is their role in the “rebuilding” of Haiti after the 2010 earthquake, in which some 300,000 died. The Clinton Foundation played a major role, with Bill Clinton himself co-chairing the panel that distributed all international aid to Haiti. The entire aid effort was used to ram through pro-market restructuring, while American and then UN “peacekeepers” patrolled the country to prevent any opposition from the population. The Obama administration made no objection to the Algerian donation to the Clinton Foundation for the simple reason that it was entirely in line with American foreign policy in Haiti. 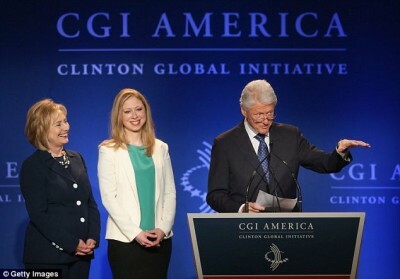 The Clinton Foundation’s version of “charity” also involves imperialist intrigue. This included secret maneuvers last year against Sri Lankan president Mahinda Rajapakse, which ultimately led to his electoral defeat last month. The country’s former president Chandrika Kumaratunga, who joined the Clinton Foundation in 2005, played the major role in backroom deals that led to Maithripala Sirisena’s sudden departure from the government and announcement that he would be the “common opposition candidate.” Earlier this month Kumaratunga admitted that unnamed “foreign governments” had urged her to maneuver against Rajapakse. During her time as secretary of state, Hillary Clinton took the lead in denouncing the Sri Lankan government’s “human rights record” in order to pressure it to move away from its ties with China as part of the Obama administration’s “Pivot to Asia.” She presented resolutions in 2011 and 2012 in her capacity as secretary of state demanding that the UN take action against Sri Lanka for human rights violations during the civil war against Tamil separatist guerrillas.